Oftentimes, companies or organizations that are considering subscribing to OnTime ask about its zone-to-zone pricing capabilities. The OnTime suite is equipped with a multitude of features that make zone-to-zone pricing viable. This type of pricing method offers the ability to type in two ZIP Codes and receive an approximate quote. Zip code-based zones are generally not considered the most accurate method, especially for couriers that service a limited area. 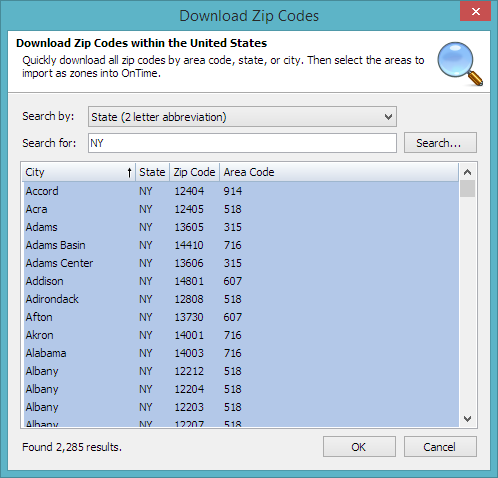 ZIP Codes may cover large, irregular areas and, most of the time, distance is measured from the center of the ZIP Code. The actual address being shipped to may be miles away from the zip code's center, resulting in inaccuracy. 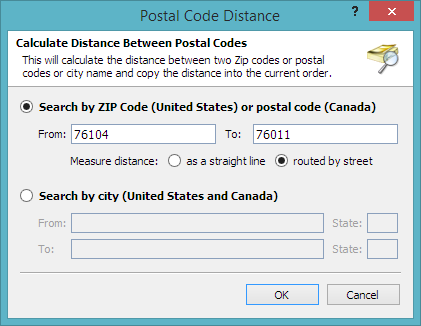 Because the two zip codes represent two separate zones, the discrepancy essentially doubles. Additionally, zone-to-zone shipments are generally measured in a straight line, not along the route that drivers will use. As a result, the distance calculated will almost always be shorter than the distance driven. Potential inaccuracies will generally cause zone-to-zone measurements to be 5 - 30% shorter than the actual distance. Because of these discrepancies, OnTime includes a sophisticated mapping and routing web service that will calculate the exact distance by road between two locations, accurate to 1/10 of a mile. Considering the above issues, why would someone want to use zone-to-zone pricing? Speed: When you need to supply a customer with a quotation, zone-to-zone pricing with ZIP Codes will offer access to a quick and approximate quote. Simplicity: Couriers who have yet to develop a comprehensive pricing structure can use tools in OnTime to automatically download hundreds of zones in just seconds. Those zones can be quickly assigned pricing structures. 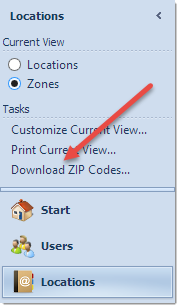 Quick ZIP Code Lookups are made possible, as detailed below. In the example above, two ZIP Codes from the Texas area have been entered. Locations may also be specified by city and state, instead of by ZIP Code. Note: This tool can only measure distances within the United States and Canada. Other mapping features within OnTime can be used for other countries. Once the appropriate information is set up, this process of generating a price for the customer will take dispatchers less than 15 seconds. This feature is available in OnTime software versions 2.3.1002 or higher. Standard or higher level subscribers may access this feature for free. At OnTime, we are constantly searching for new features that will help our users save time and money. 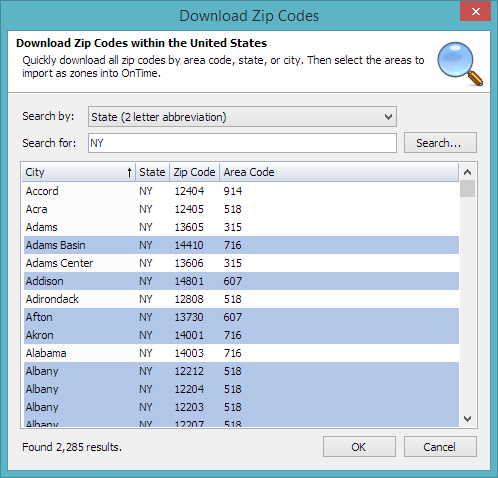 Some customers have expressed a desire for quick access to ZIP Codes. OnTime has always allowed users to enter zones in by hand or import them in bulk from Excel spreadsheet files; however, these methods were not always helpful to couriers without such spreadsheets to import from. With OnTime, you can quickly download zones from our web service, free of charge to OnTime Standard or higher level subscribers. 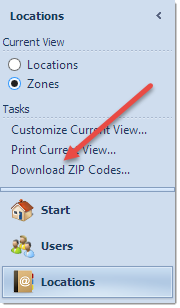 Note: This service works for the ZIP Code system within the United States and does not work for other countries. Tip: Click on the column headers in the list to re-sort the columns. At this point, if you click the OK button all of the items in the list will be imported as zones. The city name will be used as the name of the zone. The items highlighted in blue will be imported as zones. Remember: To select individual items from this type of list, hold down the control key (CTRL) on the keyboard while clicking the desired items. Once the desired items are selected, click OK. The new zones will imported and a message box should appear. If you create a large number of zones, merging them together may make your database more manageable. OnTime makes this process easy with its function to merge zones together. To learn how to use this feature, click here. When zone-based pricing is used, an unruly number of zones may be created. Fortunately, those zones can be consolidated. Starting in OnTime version 2.3.1002 zones you may easily merge zones, while OnTime takes care of the heavy lifting. If thousands of addresses and locations have been tied to a zone, you needn't go through and manually change those locations to a new zone. OnTime can automatically re-assign and consolidate zones for you. To take advantage of this feature, open OnTime Management Suite and click on the Locations area. Ensure that the Zones list is displayed. To merge multiple zones into a single zone, select the zones from the list to be merged and then right-click them and choose Merge. The resulting window will ask for a name for the new zone created by this merge. If any of the merged zones had been previously associated with locations or addresses, you may instruct OnTime to automatically update those locations by ensuring that the Automatically update locations to use the new merged zone box is checked. Click OK to merge the selected zones into a new zone and remove the old zones. Turn on your Bluetooth GPS receiver and open the Bluetooth Manager. Tap on Start > Settings > Connections tab > Bluetooth Icon. Ensure that the Turn on Bluetooth box is checked. Tap on Devices tab and select New Partnership... After a few seconds, the BT GPS Device ID will show on the Select a Bluetooth Device page. Tap once on the BT GPS Device ID and select Next. Enter the Bluetooth device’s passkey (consult your user manual for this key) and select Next. Check the Serial Port checkbox. Tap on the COM Ports tab and select New Outgoing Port. Tap once on the BT GPS Device ID/Name and select Next. Select a COM Port for this outgoing connection. UNCHECK the Secure Connection checkbox. Launch OnTime Mobile for Windows Mobile and start the GPS service. Important Note: Some models may not have COM 6 listed. In such cases, we recommend that you select the highest COM Port number first. If the higher number does not work, delete the outgoing COM Port and use the second highest available COM Port from the list and re-test. OnTime 360 courier software, provided by Vesigo Studios, recently added Webhooks to its OnTime API. The OnTime API allows users to connect other applications and services to their OnTime account. These new Webhooks are available as part of the OnTime Workflow Designer and make efficient, real-time, two-way communication a reality for anyone using the OnTime API. “We are always excited when we can implement a technology that will open up more opportunities for couriers. By extending our platform API with Webhooks (HTTP POST) we are able to make real-time communication a reality for our customers in the developer community. And because of the ubiquitous nature of HTTP POST, virtually any system and programming language can take advantage of this,” says Jeremiah Tilley, Principal Software Architect at Vesigo Studios. A webhook is like an API endpoint, but inverted, allowing applications to receive output from OnTime. Instead of making a call to the OnTime API, users define a callback URL that OnTime will HTTP POST information to as events occur. That callback URL can then execute code based on those POSTs. Webhooks are compatible with virtually any programming language, website, or software system. The two-way communication that Webhooks make possible can be utilized by developers to create apps that send and receive information from customers and employees. Additionally, OnTime can now be connected to existing applications and services and make more effective use of actions relating to communication. The OnTime Workflow Designer makes it possible to set up Webhooks that automatically post with dynamic information when a subscribed event occurs. This is accomplished by including dynamic data in the query string of the URL as it is posted. The OnTime API is available with OnTime Enterprise subscriptions and higher. Informative and instructional documents are available at www.OnTime360.com. Vesigo Studios, provider of OnTime courier software, is a software development studio with a proven track record of building successful business solutions for our clients both large and small. Established in 2000, Vesigo offers years of software development and internet solutions experience. Vesigo always keeps pace with new technologies, creating solutions that boost productivity and make fiscal sense for our clients. For more information, visit www.ontime360.com. Vesigo Studios, provider of OnTime courier software, has released new features and enhancements for the OnTime Customer Web Portal. This update underscores the company’s commitment to providing couriers the tools they need to maximize efficiency while satisfying their customers. New customization options have been included in the OnTime Customer Web Portal. OnTime users may now choose to make basic or more advanced changes to their Customer Web Portal. Basic customizations include changes to the title, the addition of a tag line, and custom logo or graphic in each page’s header. Advanced customization replaces the need for FTP access to the Web Portal’s Master Page and CSS files by allowing for direct editing of these files. Another addition allows invoices to now be viewed by customers via the OnTime Customer Web Portal. This feature is optional and can be turned on or off by OnTime administrative users. Invoices may be marked individually as available for customers to see online. The format and appearance of these invoices can be customized by uploading a standard and simplified invoice template to the OnTime Customer Web Portal. In this update, the OnTime Customer Web Portal has been re-designed to be fully HTML 5 compliant and responsive for superior compatibility and performance on newer computers, tablets, and smartphones. Additional API methods have been included with the enhancements to the OnTime Customer Web Portal. The OnTime API has been expanded to nearly double its previous size. The API documentation has been updated for reference. “Simpler methods of customization and the ability to display invoices in the OnTime Customer Web Portal were common customer requests and we are excited to deliver both of these to our customers. I am excited to see opportunities like this where we can add features that enhance the customer service experience transportation companies can offer their clients,” says Jeremiah Tilley, Principal Software Architect at Vesigo Studios. OnTime recognizes that its customers need to focus on their business without sacrificing the quality, efficiency, or security of their courier software. That’s why OnTime is regularly updated with additional features and enhancements. Find out more about OnTime courier software and the OnTime Customer Web Portal at www.ontime360.com. Starting with version 2.3.903 of OnTime desktop applications, built-in network diagnostic tools will offer access to troubleshooting from within OnTime programs. The test in the utility will help to diagnose the source of any issues regarding network or internet connectivity. This information will also help Vesigo technical support personnel resolve connectivity issues. Start OnTime Management Suite or OnTime Dispatch. Select the Help tab and choose Troubleshoot Network Problems. From the resulting window, click the Start Test button. The test may take a few minutes to complete. How much can OnTime save you? Since its release in 2006, OnTime has been ahead of the curve: running in the cloud since the beginning and continuously contributing to the improvement of that technology. OnTime can help most businesses quickly save dramatic amounts of money. To help put these savings into perspective, we’ve launched the OnTime Savings Calculator. Answer a few basic questions to see how much OnTime can save your courier business. OnTime Mobile can instantly send and receive notifications regarding modifications made to order assignment and status. Instant updates eliminate the necessity for frequent synchronizations to access changes made in the system. This new feature is fully integrated on devices with the Windows Mobile 5/6 operating system. If you are using a device with the Windows Mobile 2003 or 2003 SE operating system, notifications will appear but not be integrated into OnTime. Before attempting to use any new features, ensure that copies of OnTime Management Suite and OnTime Mobile are up-to-date. The instant update feature may be implemented on a user-by-user basis, allowing you to only activate the feature for users that have compatible devices. To offer a user access to the feature, open the OnTime Management Suite and select the users section. Check the option to enable SMS text messaging notifications for the user and enter the SMS address for the user. Every carrier has a different setup for the SMS addresses, so if you are not sure of the appropriate SMS email address, contact the user's cell carrier. The address will usually be formatted like "6781231234@messaging.sprintpcs.com." The vital link with your people in the field is accomplished through OnTime Mobile. In addition to OnTime Mobile Web’s rich HTML5 interface and native apps for smartphones, there are two other ways that driver data can be accessed in the field: The Windows Mobile 5/6 platform and WAP enabled devices. A robust method of access is with a Windows Mobile 5, 6, or 6.5 enabled phone. These are also referred to as Pocket PC devices. You have access to a wide range of the data that may be needed in the field, such as customer and address lookup. Since the screens on these devices are larger, we can fit a lot more information on them at one time without having to scroll around. The largest advantage of the Pocket PC phones is that OnTime can run an offline database which allows the driver to fade in and out of cell service without ever missing a beat. Other features, such as the ability to capture digital signatures, are only available on the Pocket PC because of it's touch screen nature. Smart synchronization efficiently moves data back and forth in a way that conserves data bandwidth, a plus for those with data plans that are metered. Many other cell phones support wireless application protocol (WAP) to display web content. Even many "free" phones support this technology, so it is not difficult to make this available to your drivers. OnTime Mobile supports 10 different variations of WAP, which means that it will work and look its best on every device on the market today. You will get most of the same information as you see in the Pocket PC version, but there are some limitations. For instance, you will not have the ability to capture digital signatures since there will generally be no touch screen available. Another drawback is the need to be online all the time. Since WAP requires a constant internet connection, you will need at anytime you want to refresh data. So while the experience is not as comprehensive, it is an affordable, and in many cases, sufficient alternative to more expensive PDA phones.